Even though Roomful of Blues’ lineup has changed over the years, the band has always been one of the tightest, most joyful blues ensembles in the world. Currently an eight-piece unit led by guitarist Chris Vachon, the band has never sounded fresher or stronger. In 2010, singer Phil Pemberton took over the vocal duties, bringing his sweet and soulful vocals and adding another bright new dimension to the jazzy, jump-blues musical roots. Their winning combination of jump, swing, blues, R&B and soul remains their calling card, as does their ability to fill the dance floor. 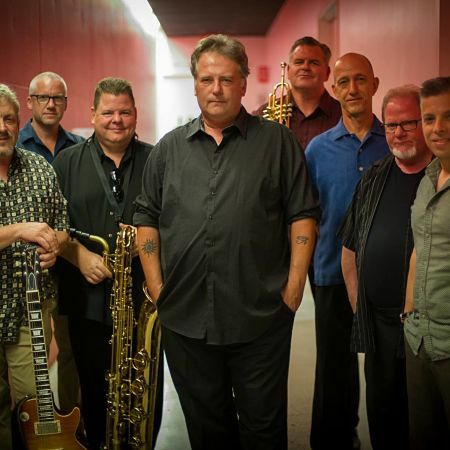 Along with newer members, bassist John Turner, trumpeter Carl Gerhard, drummer Chris Anzalone, and keyboardist Rusty Scott, and longtime members baritone and tenor saxophonist Mark Earley, tenor and alto saxophonist Rich Lataille , Roomful keeps on rockin’ in 2019.